The Boy Who Ran is the story of a Native American orphan attempting to find his place in the world. It is set near Ohio around 4000BC (during the Mid-Archaic Period) in North America. "A story of courage, perseverance and friendship, this book belongs on all shelves for children aged nine to ninety." —a reviewer's comment from 'L' -a reader from the UK. "THE GIVER meets HATCHET, set 6000 years in the past." —David Yoo, Author & Teacher. During the writing of The Boy Who Ran, I took a few liberties, borrowing some of the cultural aspects for the mid-archaic period Americans from their descendants, plains North American Indians, or Native Americans. I also took descriptions of mound technology from different areas of the country and slightly broadened the era I considered. In the book, The Eldest Village is the place were The People returned in the fall to winter. It was never precisely geographically located in the story, although I thought of the place as being located in Ohio. We can’t really know a great deal about how the people actually lived during that era, except what we can glean from artifacts we find. I guess things about the culture and borrow some elements of culture from what I learned about how their distant descendants lived (some 6000 years later). But this story remains, first, a work of fiction, although I try to be consistent with what is known about The People and about what flora and fauna are native to North America. In the story, The Eldest Village was where this group’s ancestors settled when they migrated from the far north. Remember that people probably migrated to North America around 12 thousand years ago, so their ancestors had been on the continent for quite a while already. I deleted quite a lot of the original (first draft) narration that further defined the lifestyle of The People for the sake of the story’s pace. For example, I originally described how other villages formed from this Eldest Village—a group (or village) would split off when the population grew too large, and this would create a related village. The people of this new village would leave the area to find a new place to call their home in some other region. Villages could be related, like cousins, yet their lifestyles might well be dramatically different from each other. For example, some of the “daughter villages”—meaning the people who left—settled near bodies of water, becoming lake people. Perhaps these people fished more than they hunted and even made boats. People from different villages could trade goods with their related villages, maybe swapping dried fish for bison and hides or even pottery, jewelry, or other tools and implements. My guess is that, periodically, perhaps every five or seven years, people from many related villages might gather for a meeting or meetings. This would offer an opportunity to share stories, trade, and to find mates who were less closely related. Of course we don’t know for sure that such splits and meetings happened, but they seem a reasonable things for people to do. We would also expect villages to split up in an effort to prevent an area from being over-hunted or exploited for materials and it’s also reasonable that these people would want to stay in touch, to benefit from the advantages of a larger virtual village. “The Cakes” The People used nuts and grains, ground with a stone mortar and pestle arrangement into a kind of flour, then baked on hot stones to form a kind of unleavened cake or bread. This provided the carbohydrates The People Needed and was eaten with other things, like fruit or pemmican. Pemmican is a concentrated energy food that consists of dried meat, ground into small pieces then mixed with dried fruit and herbs and mixed with rendered fat. Pemmican can be cut into blocks or used to fill the intestines from animals, then twisted into links—like hotdogs—to make a convenient-to-carry concentrated energy food. Dried Meat was derived from various animals, including bison, deer, bear, squirrel, rabbit, and other game. The meat is dried over low burning fires and the smoke from the fires both helps to preserve the meat and to keep insects away while it’s drying. Organs, like the stomach could be used as a water bladder. Mounds or Lodges Homes were dug into the earth and the floors covered with woven mats of grass, then covered with earth and sod held up by wood and bone structures. The Long Lodge: A gathering place for the community, essentially a mound large home, rectangular in shape and large enough for The People to gather together inside during bad weather. Atlatl: This is a hunting weapon, is essentially a lever approximately the length of a hunter’s forearm, used to throw darts, which were larger than arrows but smaller and lighter than the thrusting spear. The Atlatl can also be made to throw stones to hunt birds. The atlatl and the short, lightweight spear or dart it throws, also both store energy during the throw by flexing. The hunter can fine-tune the degree of flex, both by selecting a specific dart, and by adjusting the atlatl itself, using a stone weight called a Bannerstone. The projectiles (darts) were like long arrows, much lighter than the spears hunters used to thrust into animals. 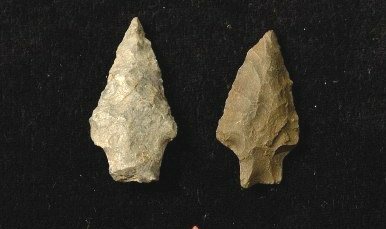 The darts were equipped with stone points (flint or quartz or other similar stones) and the darts were fletched with feathers, like an arrow, to make it fly true. The bannerstone might have been carved into the shape of an animal as a hunting talisman. Examples of the Stanley Point flint spearpoints, as described in the book. The original prologue didn't contain scenes of violence, but two of my beta readers suggested that the book needed something more up front, and so I quickly dashed off the prologue that appears in the book and sent it to them that same day, and they approved of the change. This original prologue examined the nature of the boy, alone as he watched a pair of deer feeding in the forest. It was intended to give a sense of the boy and how he spent much of his time. 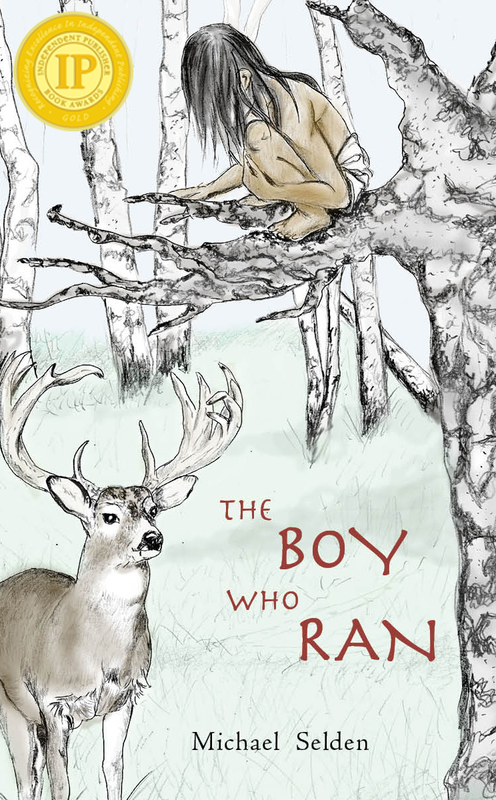 Some of the Inspirational Themes for "The Boy Who Ran"
The Boy Who Ran is a narrative tale and a parable. Besides its main goal of telling a story in an interesting way—or so I hope—I also wanted it to inspire young readers with the principle of dedication and focus, but also to show how any virtue, when taken too far, can lead to a kind of inflexibility, even destructive behavior. The original inspiration for The Boy Who Ran came from of a theme I remembered rather than a complete story. For some reason, I was thinking back to a book I’d read in 1976 called “Jonathan Livingston Seagull” and its theme, a kind of seeking perfection trait. I recalled the single-minded determination of Jonathan, a rather unusual seagull, to fly ever faster. Seagulls are not especially constructed for fast flight, but Jonathan was an exception. While it was not exactly realistic, the story demonstrated this theme of a singular determination to be perfect at something. I wanted to imbue some of this characteristic into the boy, although I also wanted his needs and desires to be more complex than this. The boy’s character was founded in the event that changed his life and the near unbreakable spell (of sorts) that his mother cast on him at the time. She hoped this would make him safe. The tragic event, and what followed over the next few days, forged a purpose in him in a way that is hard to duplicate artificially, but it also wounded him, much as his alter ego in the story (White Flank) had been wounded at some time in the past. There was another character with a similar tone of dedication to perfection. Red Sky was initially inspired by Kyūzō, one of the seven samurai in Akira Kurosawa’s 1954 film. This samurai had dedicated himself to swordsmanship, almost to the exclusion of all else, although it made him somewhat inflexible too. But The Boy Who Ran is as much about change as it is about anything else, not about inflexibility. Red Sky had already begun to change when we meet him at the beginning of the story and the softening of his attitude was intended as a harbinger of the changes to come for the boy, I hope in a subtle way. Some of the other characters had initial inspirations as well, but these inspirations only serve as a starting point for me. The characters immediately evolve into his, or her, own unique selves rather quickly. The inspirations are a starting nap shot and no more. There are other less-obvious themes in the book, although I hoped to show a constructive use of his determination to overcome adversity. He focuses on things he wants to happen, tirelessly, and with a dedication not found in many. In my experience as a physicist, principle investigator, and program manager, this focus is vital if you are to accomplish anything difficult. I’ve told this to young engineers and leaders before. Complex problems don’t solve themselves and the barriers to success are countless. There is always a reason, some excuse, for why we can’t get something done. There is only one reason things actually do get done. The happen when you, and everyone working with you, are determined that they will be done and you find a way to make things happen, even if it looks impossible.